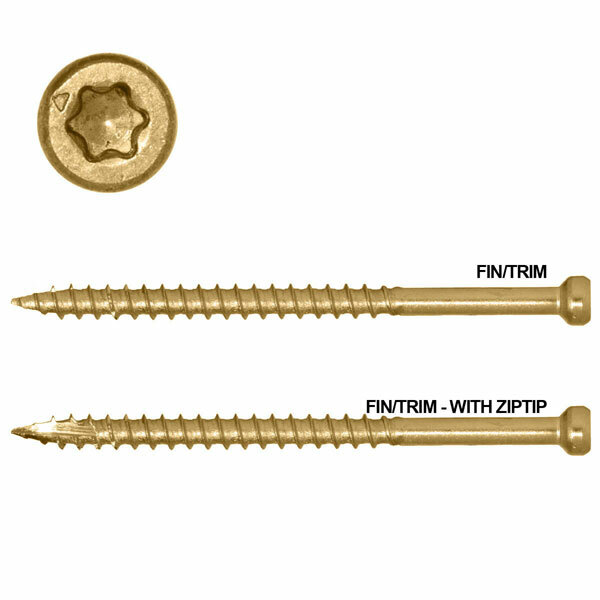 GRK Fasteners 772691-17730-8 FIN/Trim - #8 x 2 1/2-Inch In. The smallest head on the market for a clean, finished look! Perfect for all interior and exterior finishing applications including deck rails, exterior wood trim, stairs, banisters, window and door trim, base boards, crown moulding, and joining cabinets. For use in all applications including pressure treated lumber. They are self-tapping eliminating the need to pre-drill, features W-Cut threads for reduced torque, and is coated with Climatek for superior corrosion resistance. GRK's Trim Head screws are an excellent choice for most fine carpentry applications, as well as window extension jambs and more. Our Trim Head screws have the smallest screw head available; with screw lengths from 1 1/4" (30 mm) to 5" (125 mm).Most material splitting is prevented because of the Trim Head screw's exceptionally small head and the W-Cut thread design.FIN/Trim screws are also available in white Climatek coated finish to blend in with white wooden trim boards.